Uglyworld #212 - Jeero To The Rescue, originally uploaded by www.bazpics.com. 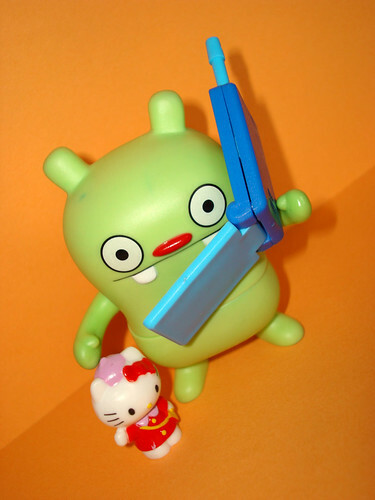 As always you can rely on the Uglydolls to pull together in times of crisis, normally Wage and Babo are the first to step up and take care of any situation, but today it was Jeero who came to the rescue with the help of the mobile phone the little guys all share. He called up Uglycabs and asked them how much it would cost to get a taxi from Aachen to Koln, and luckily enough they said that today this particular route was on special offer, such a special offer that they were doing it for free...so Jeero sorted out the details and Kitty was off on her way to Koln.